Hi all, my name is Chandni and I am a second-year interior design student and a Hallam Insider blogger at Sheffield Hallam University. 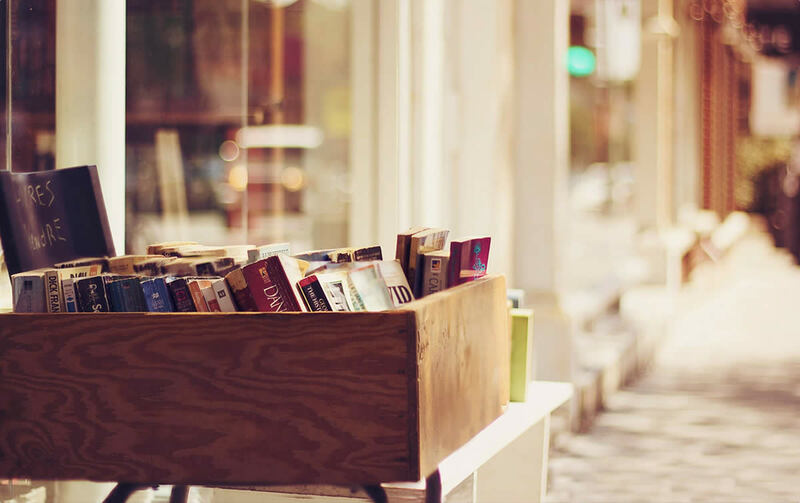 This is my first article in a series of three for Off the Shelf Festival. 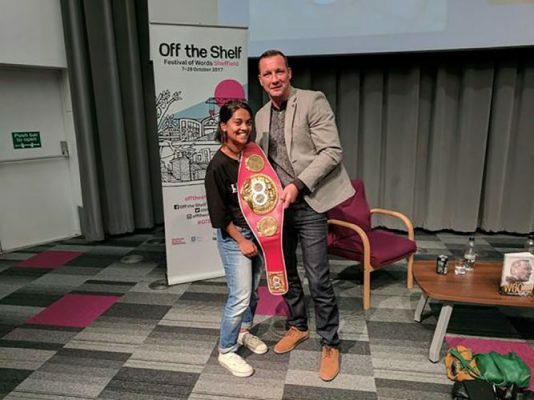 My first event was by Sheffield sporting legend and former world light heavyweight champion Clinton Woods who was in conversation with Professor Vanessa Toulmin. I will also be reporting on the Creative Writing showcase by Julianne Pachico, a new lecturer at Sheffield Hallam, and the discussion with the artist Jo Peel. Clinton Woods has won every title in boxing and according to Mark Turley, the author of the book Into the Woods, he is a down-to-earth guy who represents “the essence of boxing”. Woods’ talk was very enjoyable. He showed genuine character, with his humorous anecdotes and laid-back attitude making his fans and I laugh throughout his event. Woods explained his pride about being Sheffield born and bred. He began his talk by reminiscing about his childhood growing up in Sheffield and recollected memories about playing in the countryside on Fox Hill with his five brothers. Woods’ journey all began when he received a pair of boxing gloves at Christmas and to all of our surprise, he was gutted to receive them. His parents who were in the audience said they “ran out of ideas and he couldn’t play football”. This caused a chuckle from the crowd. Woods started from humble beginnings, training at the amateur gym, Hillsborough Boys Club. 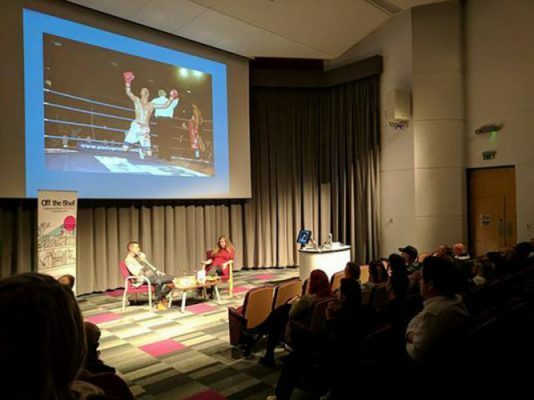 Woods shared an anecdote about competing as a child against a boy from Bradford who was fully kitted out in boxing gear, whilst Woods was in plimsolls, his brother’s football shorts and a vest. Funnily enough, I am from Bradford. Woops. In the event’s Q&A, Woods’ sister asked “Is it true that you learned to fight so you wouldn’t get beaten up by your sister?” to which Woods agreed. More giggles from us all. It was endearing to see the closeness, support and banter between Woods and his family. It reminded me of my own family’s banter and how much I value their support when I compete in the martial art that I do, Jiu Jitsu. Woods’ mother explained that she couldn’t sleep or relax at the thought of her son being in the ring the day before a fight, which I could relate to my own mum. Woods was also asked if he regretted taking time out of his boxing career between the ages of 15 and 22. He did not, as he said he got the chance to live the typical student life along with his two pet turtles. Woods’ favourite fight was against Crawford Ashley, winning the British, European and Commonwealth titles at Bowlers in Manchester in 1999. He explained it wasn’t because it was one of his bigger fights, it was because was not expecting to win it. This was a common perception of Woods, and he said he was more nervous competing locally at smaller fights, due to not wanting to let people down. However, in his bigger fights he was excited because he wasn’t expecting anything. Win or lose, Woods’ attitude stayed the same. This is a true demonstration of Woods’ humble character, and as stated by Mark Turley, Woods was unchanged by his fame and titles. So what is Clinton Woods doing now? He owns his own gym in Sheffield, Clinton Woods Boxing Fitness, which is actually his old youth club that he has converted. He regularly trains local athletes, a few of whom came to support him at this event. Woods joked about how spoilt they are with the health, nutrition and fitness coaching that they receive, all of which Woods had no access to in the early years of his career. Additionally, Woods is happily married with two children. Thank you for reading, stay tuned for the next two articles of my series!